A blog showcasing various tech things. I'm going to go over the simple steps of setting a Windows XP install to not auto-reboot on a Blue Screen of Death. While this may be nice if you get it once in a while, if, like me, you break something that prevents Windows from booting because of a BSoD having it reboot instantly makes it impossible to see what is going on. Many of you may know this, but I hadn't yet figured out how to do it until last night when I managed to prevent Windows from booting. Right click My Computer and go to System Properties (Or, if you like the keyboard, Win+Pause/Break). Click the 'Advanced' tab. 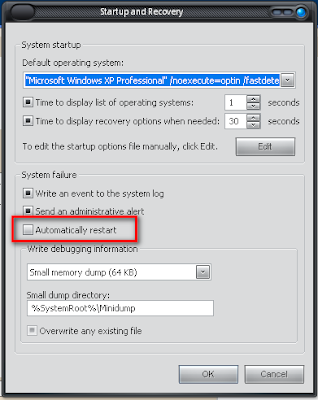 Click 'Settings' under 'Startup and Recovery'. 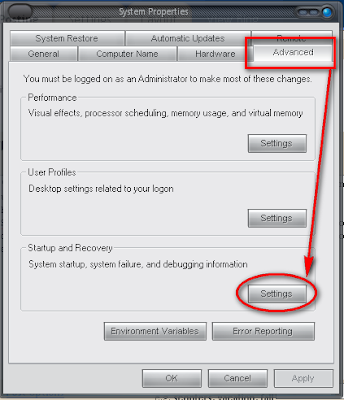 Under the System Failure heading, uncheck 'Automatically Restart'. Now, when you BSoD, you'll actually be able to -read- the error message and try to solve the problem. In my case it was a corrupt vidstub.sys file. If you are unable to even boot in to safemode to get this done, there is help! It's been a while since I've used it, but it has always worked for me. Thanks- that's some useful info. Unfortunately I have just been given a friend's laptop to fix which is doing this split second BSOD, but I can't get it to start a GUI, even in safe mode, so there's no way to choose the option you mention. Any ideas of how to enable this if you can't get Windows to boot in the first place? I've updated the post with a bit more info at the bottom that should help you out. Thanks for bringing it up!